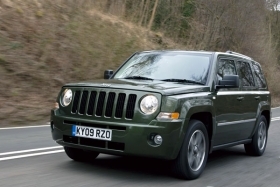 The Jeep brand will become Chrysler's leading brand in Europe in 2011. Shown is the Jeep Patriot. (Bloomberg) -- Chrysler Group's Jeep brand will become the subsidiary's primary global make in the first half of next year as Fiat S.p.A. emphasizes the Lancia nameplate in Europe, a top executive said. Chrysler's minivan, the Sebring and 300 models will be rebadged as Lancias across most of Europe at the end of the first quarter or early in the second, Michael Manley, Chrysler Group's international chief, said in an interview. Sharing models among the brands is part of a plan outlined by Fiat and Chrysler CEO Sergio Marchionne in November, Manley said. Chrysler aims for Jeep to account for half of Chrysler Group's international sales, up from closer to a third historically, he said. The goal will be to have two brands -- Jeep and one other -- from the Chrysler Group in every market, Manley said at an event to introduce the new version of the Jeep Grand Cherokee last week in California. Fiat, which also owns Maserati and Ferrari, is trying to share engines and other parts among models from Fiat, Chrysler, Dodge, Jeep and Alfa Romeo brands to save $2.9 billion over five years. Fiat controls the U.S. automaker through a 20 percent stake granted as part of last year's U.S.-backed bankruptcy. In Europe, some Dodge models will also be sold and the Chrysler name will be kept on the minivan in the U.K., Manley said. Most of Lancia's approximately 125,000 sales annually are in Italy. Chrysler-badged vehicles will continue to be sold in Latin America and Asia, while the North American use of Chrysler won't change, he said. Marchionne said April 21 that he plans to double revenue from cars and light-commercial vehicles to 51 billion euros ($63 billion) by 2014. Fiat aims to boost deliveries by 73 percent in the period by expanding in Europe and emerging markets, re-entering North America and relaunching the Alfa Romeo and Lancia brands. Fiat has a worldwide sales target of 3.8 million cars and commercial vans in 2014, compared with 2.2 million last year, Marchionne said April 21 in a strategy presentation. Combined with Chrysler Group, deliveries would total 6 million cars.